On 26 January 1880 a new passenger and cargo ship was ordered for the British India Steam Navigation Company (BISN) from the W. Denny & Brothers Limited, Dumbarton shipyard (near Glasgow, Scotland). The new ship was named SS Quetta after the Indian city Quetta (now part of Pakistan). The new ship was 380 feet long, 40 feet wide, with a gross tonnage of 3,302 tons with the keel laid on 4 April 1880. Powered by a 490 nhp compund steam engine driving a four bladed prop, the ship also had three masts which carried sails for extra propulsion. She was capable of 13.4 knots. She was launched on 1 March 1881 and on 30 April 1881 she left the shipyard and was delivered to the owners on 19 May 1881, presumably in London, England. The total cost of the new ship was £70,119. Originally built for the London to Calcutta (Kolkuta) run, she seems to have spent most of her time on the London to Australia run (via India). She became RMS Quetta (RMS = Royal Mail Ship) when she started transporting mail for the Queensland Government. 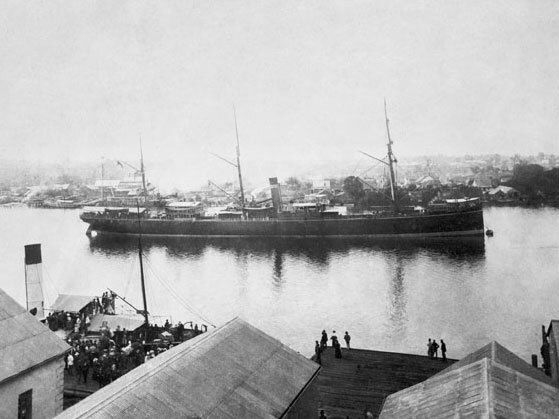 On 18 February 1890 the RMS Quetta left the Petrie Bight Wharf in Brisbane, Queensland, for the return trip to London. This was her twelfth voyage to London, but the first under the command of 42 year old Captain Alfred Sanders. Assisting him on the run through the Great Barrier Reef was the BISN Special Pilot Captain Eldred P. Keatinge. On 27 February 1890 the Quetta departed Cooktown for Thursday Island at the very top of Australia. On board were 291 people, 33 in Saloon (First) Class, 65 Steerage (Economy) and 71 Deck Class. The crew made up the rest of the numbers. The next evening the Quetta was approaching Adolphus Channel. The Captain left the Pilot and Third Officer Thomas P Babb on the bridge while he went to dinner. At 7:45 pm he came back to the bridge and was satisified that everything was safe. At 9:10 pm the Pilot ordered a change of direction to north-west to compensate for the tide. The Captain arrived back on the bridge at this time and within a few miniutes, the Quetta hit a rock. Captain Sanders ordered the engine stopped and for the lifeboats to be readied.The ship quickly started settling by the bow and unknown to the bridge, the stokehold crew were already dead, drowned by the influx of water. The Captain went forward and saw that the water was already level with the forecastle. He called out to the passengers on deck to move aft. The foreward hatch cover was blown off as the water came in from below and forced the air up. The people standing on it were blown overboard. The damage to the ship was caused by hitting the previously uncharted rock (now called Quetta Rock). The keel of the ship at the bow was bent back back and a hole ripped right across the hull at the first bulkhead. The ship was doomed as the hole was so large the water was always going to come in quicker than any pump could have ever removed. The now heavier and deeper bow caused the sinking ship to pivot around the bow as the tide swung the stern. The ship was now a kilometre north of Quetta Rock and listing heavily to port. This meant that only half the lifeboats were accessible. Two lifeboats were launched and within three minutes of hitting the rock, the Quetta sank bow first. The Captain scrambled up the mizzen rigging and kick off his shoes before the ship went down. The Pilot handed out life vests before he too was forced into the water. Captain Sanders made it into one of the lifeboats which held a total of 80 survivors. His boat only had two oars so passengers used hands to assist with the rowing. The other boat passed his, headed for Little Adolphus Island. The first boat dropped its passengers on the island and returned to the wreck site to look for more survivors. They only found a few. At 1:30 am on 1 March 1890, Captain Sanders lifeboat made it to Little Adolphus Island, four miles north of the wreck. 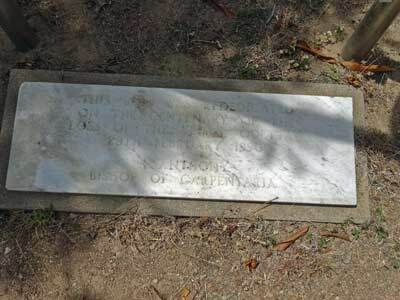 At 5:30 am, the Captain, Pilot and eight crew members took one lifeboat and set off for Somerset, a small settlement on the Pacific Ocean side of Cape York (today all that is left here are the ruins of some buildings and some graves). After first landing on Albany Island, they arrived at Somerset at 10:30 am. Here Frank Jardine (who the Jardine River is named after) gathered together a crew of his staff and they set off to the wreck site to look for more survivors. At the same time a man set off on horseback with a telegram written by Captain Sanders. This was taken 16 miles across Cape York to Paterson Telegraph Station. Just before 2:00 pm, the telegram was handed to the Administrator of Thursday Island, John Douglas, former Premier of Queensland. Within one hour the Queensland Government steamer, Albatross, was underway under the command of Captain David Reid. The New Guinea Government steamer, Merrie England, was also at Thursday Island and she too set off for the Adolphus Islands with water and provisions. The pilot cutter, Eileen, also headed there. 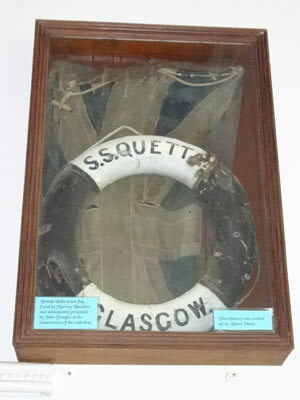 Jardine's staff in the lifeboat had already found and rescued several people found clinging to wreckage and life belts. They also found the body of Dr J. Harry Poland, the ship's surgeon and another male. Two people were seen on Achoineh Island (I have no idea where this is as there is no island by this name on my charts of the area and an internet searrch shows nothing as well), they were 19 year old Alice Nicklin and a young Indian steward, Alick. The two bodies were left ashore here, covered by the hatch cover that the two young survivors floated ashore on. They also came across a raft with 18 Javanese cane-cutters who were on their way home. Meanwhile, Captain Sanders had hailed down the passing ship SS Victoria. They turned around and headed back north and when they came across the Albatross, Sanders transferred to her. The Victoria then continued her voyage south.The Albatross collected the 98 survivors from Little Adolphus Island. This included a two year old girl whose family appeared to have died in the sinking. She had been supported in the water for several hours by Mutassa Clark, a Cingalese engine room crewman. She was the only child out of the 25 on board to survive. All the survivors were then transferred to the Merrie England which took them back to Thursday Island. 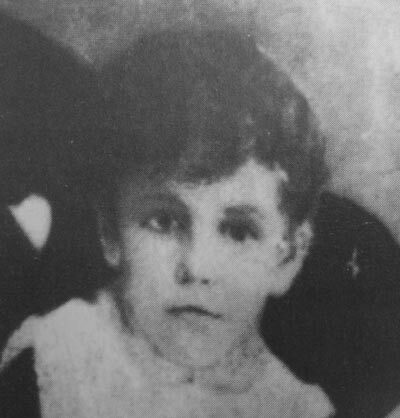 The baby's real identity was never established and she was later adopted by Torres Strait pilot, Captain Edmond Lechmere Brown and his wife Marjorie. 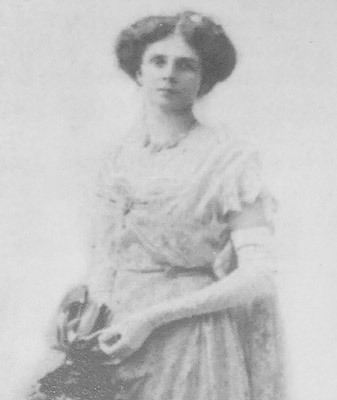 She was named Cecil (Cissy) Lechmere Brown, but was known far and wide as Quetta Brown. She died in 1949. As Captain Reid turned the Albatross around Cambridge Point towards Achoineh Island, he spotted what he first thought was a coconut in the water. This turned out to be another survivor, Emily Lacy, a 16 year old Saloon passenger. She was delerious and badly sunburnt after spending 36 hours in the water. She at first tried to fight off her rescuers, but eventually she was taken on board. Her 13 year old sister died in the sinking. Four days after the sinking, the Albatross set off again, this time with Captain Sanders, Captain Keatinge, Third Officer Babb, the local priest, Reverend Maclaren and Police Sub-inspector Savage on board. They headed to the location where Keatinge said the Quetta sank. Straight away they located the wreck, it was obvious by the way the tidal flow was pushed up by the wreck forming swirling water on the surface (this still happens today). Soundings using lead weights on lines (the old way of checking your depth), they worked out the wreck was between 6 and 13 fathoms. A fathom is six feet, so the depth was 36 to 78 feet (11 to 24 metres). The wreck was marked with a buoy and the boat then headed to Achoineh Island where they buried Dr Poland and the other male. They then went to Somerset. No other bodies were found. At Somerset, Frank Jardine advised that his men had saved 36 people and recovered the bodies of another 45 who they had buried at sea. The next morning the Albatross headed south searching for more bodies (and presumably looking for survivors on islands). Without finding anything, they headed north following the Quetta's track and came back to the wreck site. Once again they did some soundings and had anti-fouling paint on the lead (the lead weights could have some putty like substance on them to show the composition of the bottom - for example, sand would stick to it showing a sand bottom). Upon returning to Thursday Island, a message was sent to Brisbane advising the wreck had been located. One week later, two divers, Anderson and Tolman, did three dives in what they described as poor conditions. They reported that the wreck was laying on her port side and facing north-north-west. A few days later, Captain Reid in the Albatross headed back north after looking for some reported survivors. He followed the Quetta's track and on 14 March 1890 he discovered a rock (by noting disturbed surface water) that he believed was the one hit by the ill-fated ship. Soundings showed that it was 6 metres deep. A week after first diving on the wreck, Anderson and Tolman again dived it, this time in much better conditions. They reported that the wreck was now facing east-south-east (in 2016 it faces almost east, so probably has not changed since then). They also reported the damage to the keel and hull as mentioned above. They reported seeing no bodies but found some mail and brought that to the surface. On 2 April 1890 a Marine Board of Inquiry started in Brisbane. One of the first items raised was that on 24 March 1877 the SS Thales reported hitting a rock off Cambridge Point. However, the Board found that the Thales had probably hit the reef surrounding some rocks called The Brothers further south-east. On 26 April 1890 the Board found that "the loss of the Quetta was occasioned by striking an unknown rock" and exonerated Captain Sanders and his crew and Pilot Keatinge of all blame for the sinking. In November 1890 the diver Anderson once again dived on the wreck. This time he was attempting to salvage cargo, specifically 60 tons of silver and tin ingots being carried in the rear hold. This had been loaded at Port Douglas. He was assisted by other divers and placed dynamite charges on the starboard hull above the hold. These were set off by battery from his ship. The hull was successfully opened up, but the divers (using hard hat gear) encountered clouds of wool and tallow that had been liberated from the hold. They eventually salvaged all the ingots, valued at over £7,000. They also recovered other items including personal papers, clothing and jewellery. They also recovered the ship's bell. In 1906 Anderson also recovered some other items including a porthole and a lamp. 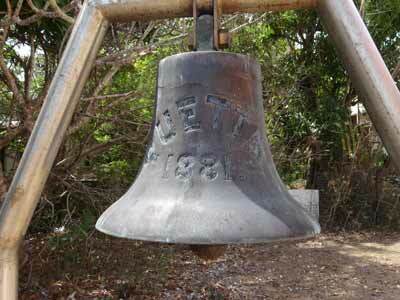 The bell was presented to the Quetta Memorial Church at Thursday Island. 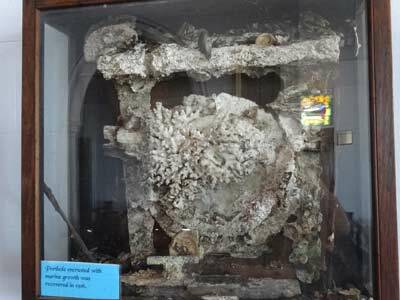 It is located on the western side of the old cathedral while the porthole and a life ring (found on Albany Island) are located inside. 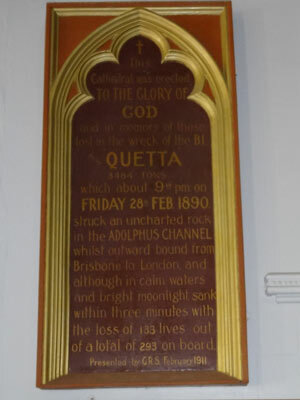 There are also some plaques to the loss of the Quetta as well as some stained glass windows depicting the sinking. 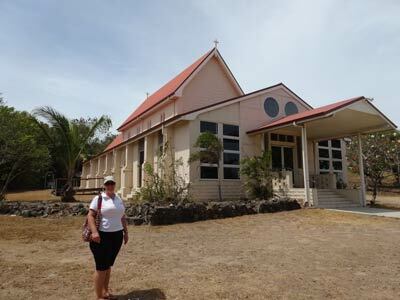 The church is located in the main street of Thursday Island, just down from the Torres Hotel (the most northern hotel in Australia). Today the wreck is located in the Cape York area of Queensland, the wreck is located at GPS position S 10 39' 52.5" E 142 37' 25.5". This is about one nautical mile south-west of Mount Adolphus Island and 5.6 nautical miles east-north-east of Cape York. 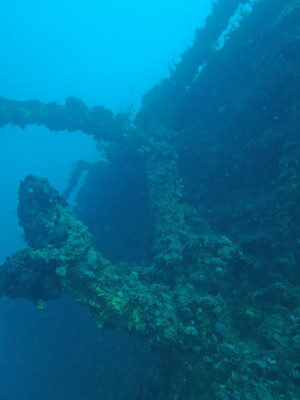 The bottom is about 22 metres deep and the shallowest part of the wreck (the upper starboard railing) is about 10 metres. This means you get very good bottom times (more later). It is in Adolphus Channel which has very strong tidal currents. It can only be dived at slack water after high or low tides. When I dived it, slack was about 20 minutes after high tide but about three hours after the low tide (which was only 0.2 metres lower than the previous high). As this is such an isolated location, almost a thousand kilometres by air from the nearest real city (well over a thousand by road and many days drive) and something like 600 kilometres from any real town, the wreck rarely gets dived. 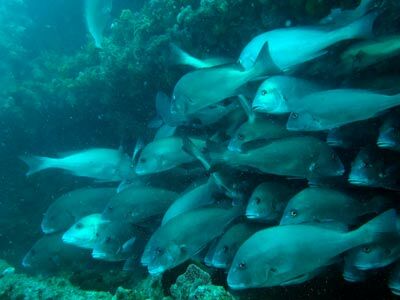 There is no dive operation that goes there regularly and the only way to dive it is to charter a boat with a group or get on one of the couple of trips that another dive operator sometimes makes to this area a year. I prefer not to give publicity to that one for my own reasons. In any case, the cost to dive it is a lot. We dived it by getting a group together from our dive club and chartering Kalinda for 10 days for a trip to the Great Barrier Reef from Thursday Island. As such, we had the whole boat. It can also be expensive to fly to meet the boat (wherever to Cairns and then Cairns to Horn Island). The wreck roughly lays bow to the east, but pointing a little north. The bottom is sandy, but not flat, there are lots of gullies, probably caused by the strong tidal flows. Your boat will anchor on the sand near the wreck so that the stern is over or near the wreck. 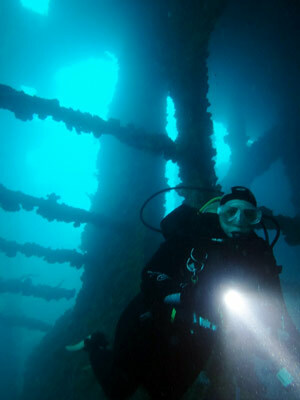 A shotline will be dropped on the wreck or taken over by a crew member and tied off to the wreck, perferably to the area near the centre mast. My description of the wreck is based on this premise. From the shotline, drop to the mast where there is normally a large school of fish. This mast still sticks out perfectly at right angles from the ship and does not even touch the sand. From here head to the stern. You can go on the outside or drop down a level and swim along this deck. You will eventually need to exit the wreck as you cannot continue to the stern from inside. Along the way, check out the many holes in the top deck, some of them contain large numbers of huge fish. Swimming along the lower decks gives lots of great photograph opportunities. You will pass the rear mast which has collapsed a bit to now be on the sand for most of its length. Once at the stern, head around the the hull side. You will immediately see the huge rudder and four-bladed propeller. With any reasonable visibility you will have a really great chance to get an amazing photograph. Depending on the time of the day, the best photo may be from forward of the prop or in the afternoons, from the stern. 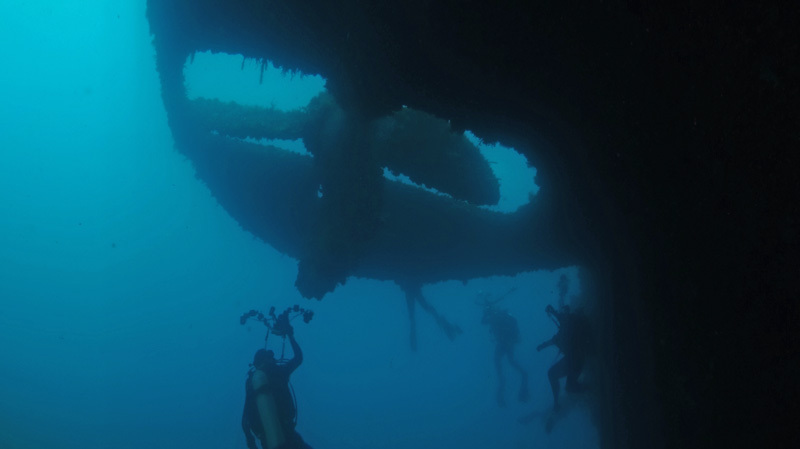 The prop is really impressive, you will want to spend some time here and also visit on each dive if you are lucky enough to be able to do multiple dives on the wreck. From here, return to the main deck and swim forward. Again, you can either stay on the outside or go through a deck or two down or inside the holds. The rear hold has a huge salvage hole in the hull where the hard hat divers blew it open to salvage the tin and silver. When you get back to near the main mast, look for signs of at least one full porthole still in place. Forward of the mast is the funnel, or at least the remains of the funnel. The main part has fallen to the sand and collapsed, but there is still a small section attached to the ship. You can see inside towards the boiler. You can also access inside this area to see the boiler and the engine. For now, it is probably best to keep going forward. If you go back into the wreck, you can jump from one hold to the next. Eventually you will come to where the hole in the hull that sank the boat. You can exit out this (after taking some nice photographs looking out the hold and the hole). 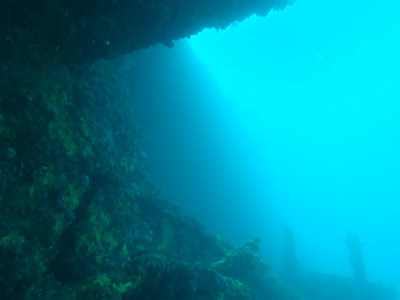 Once outside the wreck you will be on the bottom of the hull near the keel. Head forward and you will soon see the huge amount of damage caused when the ship hit Quetta Rock. The damage is very, very obvious as you can see from the photograph below. Once you have looked at this, head forward to the bow and around to the top of the bow. As you come around the bow, you will see the ship's two anchors if you look carefully. The starboard one is hanging from the starboard side of the hull over the top deck, the chain stretching back to the howser. Looking down from here, you will see the port anchor on the sand just north and clear of the bow. There is a lot to see in this area, including the forward mast, the forecastle, the winches and more. You can also see the entrance to the forward hold. You should still have a lot of time to explore, and so long as you are good on your air consumption and have not encountered any strong currents, plenty of air to see more of the wreck. Time to here should be about 20 or 25 minutes. 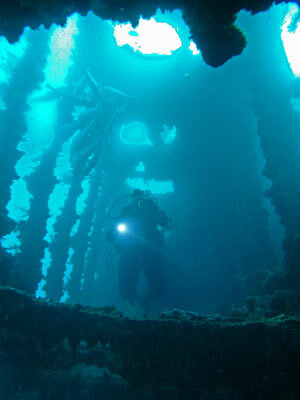 Head back towards the shotline area, again, checking out some of the many entrances to the wreck. 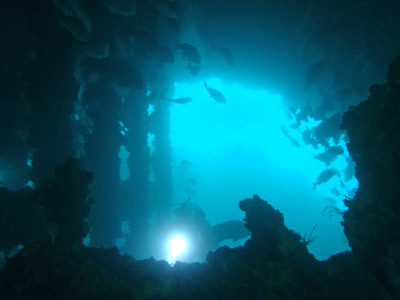 Most of these are very safe, but there are a couple where you should not go unless you have dived the wreck many times and execute proper cave or wreck diving procedures. If you start getting low on no deco time, you can ascend a little and keep exploring. Around the middle mast there is a lot to see. While this wreck does not have the marine growth of the SS Yongala in Townsville, it certainly does have some spectacular fishlife. 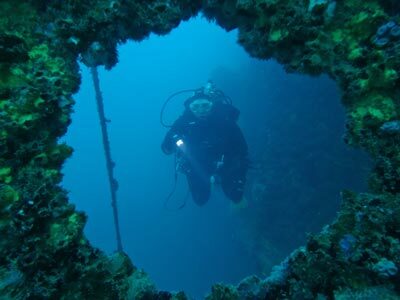 Once you are really running out of time, spend the rest of the dive on the shallowest part of the wreck before ascending for your safety stop. 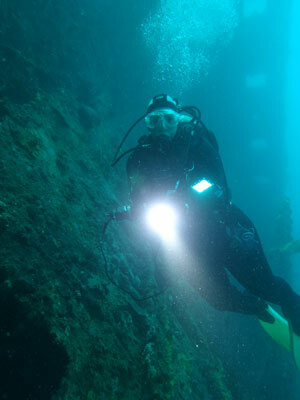 As this is a very remote location, I would recommend doing as much safety stop as you can, especially if you are diving it towards the end of a dive trip. On my two dives here (with about a six hour surface interval), I did 40 to 42 minutes on the wreck followed by safety stop and surfacing. This was using air. Even if I had access to nitrox, I probably could not have stayed much longer as the real limitation was the amount of gas available. I started with 200 to 220 bar and ended up with about 70 bar. Most people would have had about 30 bar left doing the same dive. 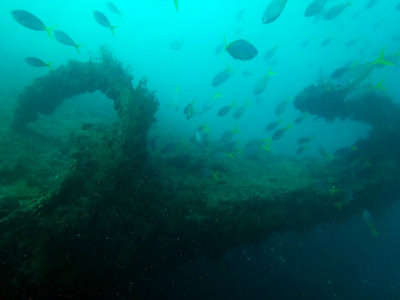 This is a brilliant wreck, certainly the second best wreck I have dived in Australia (the Yongala is of course the number one). 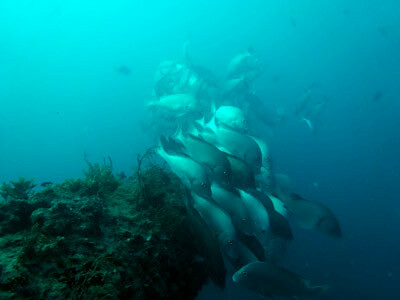 It is a pity that it is so isolated and rarely visited by dive operators. If you ever get a chance to dive it, go!